Broadway across Canada and Evenko recently brought Disney's Beauty & the Beast to Place des Arts' Salle Wilfrid-Pelletier (SWP). With the Orchestre symphonique de Montréal having moved to its new home at Maison Symphonique, SWP accommodated this family-friendly production for an extended springtime run – a rare treat for local audiences. Excited children who attended the premiere, basked in delight – they were ecstatic to be out on a school night – as parents and grandparents were equally enthralled by the 'tale as old as time'. Particularly pleasing were the colourful costumes -- an eye-popping 580, plus 81 wigs -- vibrant sets, dramatic lighting and cool....er....make that smokin' hot pyrotechnics. 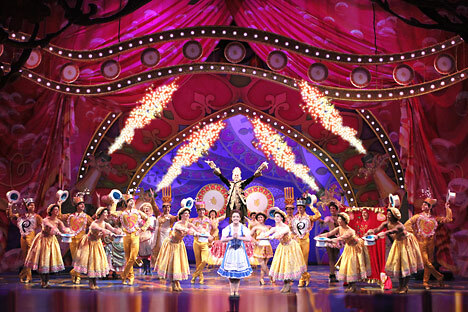 The cutesy French accents added an amusing provincial feel to this lavish production. Featuring the animated film’s Oscar-winning score with music by Alan Menken and Howard Ashman's libretti, this production also incorporates additional songs by the same composer with lyrics by Tim Rice. The book is written by Linda Woolverton. This touring production also reunites the original creators of the Broadway blockbuster. It is directed by Rob Roth, choreographed by Matt West and Tony-winning costumes are designed by Ann Hould-Ward. 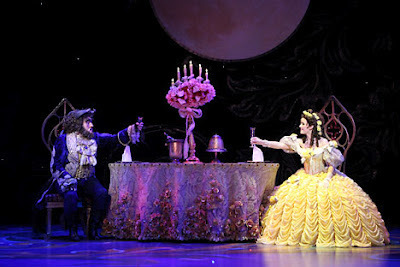 Lighting is by Natasha Katz, while scenic design is handled by Stanley A. Meyer; John Petrafesa Jr. serves as sound engineer with music supervision by Michael Kosarin. The performance, together with one intermission and curtain call, lasts almost 3 hours; count on an extended, rousing standing ovation, as was the case on opening night. It is a heartwarming, tale of home, hearth and happy endings that will appeal to all ages and generations. www.laplacedesarts.com; www.evenko.ca or call the box office 514-842-2112. Prices begin @$40.00 for weekday matinees. Parents may obtain elevated seats for toddlers in the foyer of Salle Wilfrid-Pelletier.